Outside-- It's in the teens and we still have several inches of crusty snow. Inside-- I've been stitching on Early Spring (working title). I printed this design about a year ago for Carol Eaton's turn as queen of The Printed Fabric Bee. It just so happens to be her turn again...I have some interesting ideas that I plan to work on over the next few days. It's bright and sunny today...a real difference from the last few days. I decided to take a photo of the strong sun on the piece. I've mostly been stitching at night. I find it soothing and centering. There's been a lot of great things going on...blog tours, book signings and teaching classes...but...it's important for me to find a bit of quiet time. I almost have the backing/border sewn down. Next I'll be stitching a bit on the border. I haven't decided if I want to do some subtle stitching around the flowers...more like an echo. What do you think? 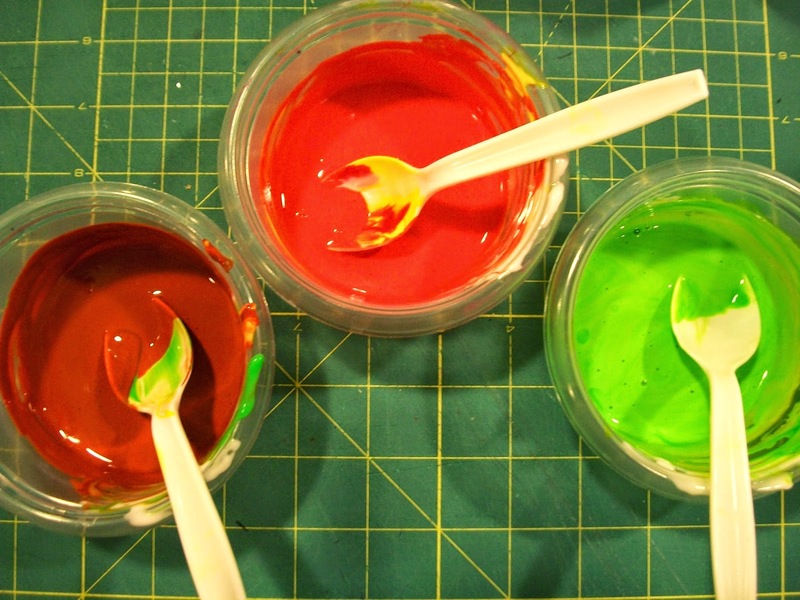 It's the third Thursday of the month...time for a little Roy (G Biv!). This month's color is ORANGE. I had to hit the photo archives this month (I've been a bit busy with book stuff!) 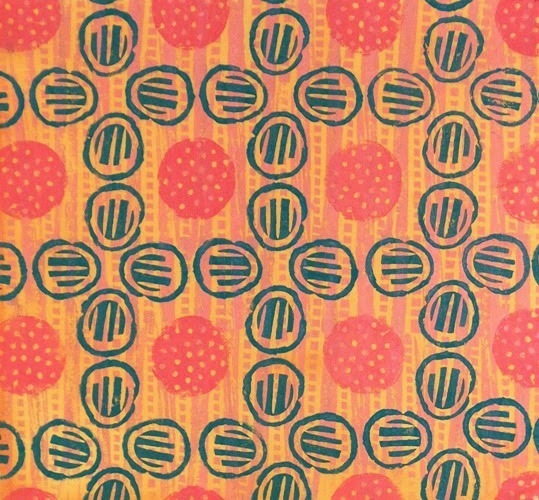 and I decided that I must like ORANGE since it shows up a lot in my fabric designs! You can play along with my colorful cohort, Jennifer Coyne Qudeen, and I by posting up to five ORANGE photos and leaving a comment. We will link to your blog post for a wonderful, colorful blog hop! I'll be updating this post through Saturday, February 21 midnight (eastern USA time). Come on...Join in the fun! Jennifer has gotten around once again...NYC and CT ORANGES. Love the Rothkos and the parking garage optical illusion. Fiona at Paper Ponderings offers some Thursday Thoughts about reading and dreaming and an ORANGE sunset that will warm all those in the Northern Hemisphere. 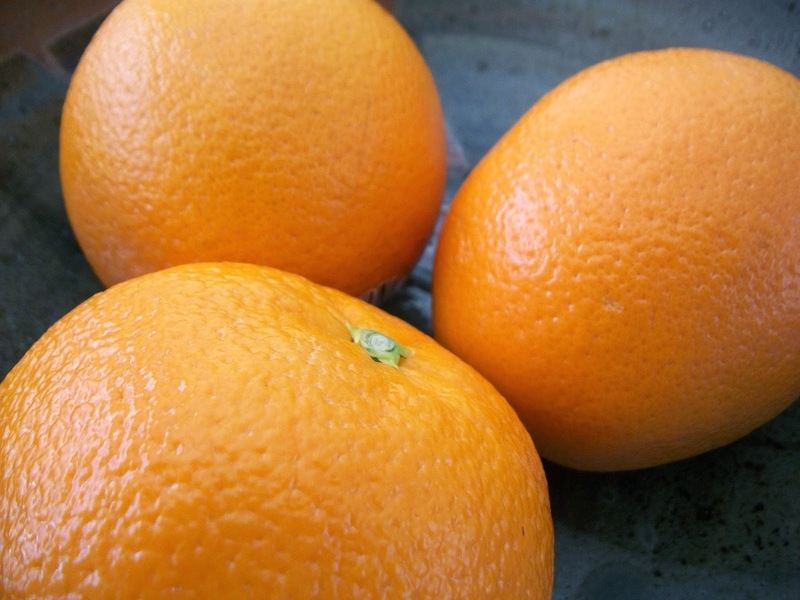 Sharmon Davidson has some inspiring ORANGES! 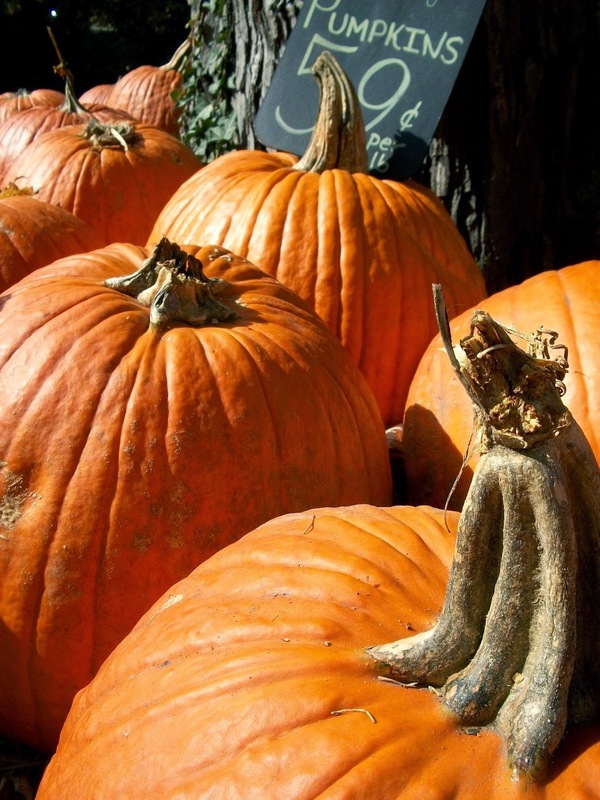 Linda Stokes has an array of scrumptious, textural ORANGES...such a warming color! Elfi has a unique selection of ORANGES love the lizard and the tree drawing! Mary Ann at Blue Sky Dreaming has ORANGES that really sing! Love the stitched piece. Maya at Take Diversion has some exotic ORANGES. Lisa at arzigogolare has inspired me with her joyful ORANGES! Eric at Cerulean has some very artistic ORANGES. Margaret at Charlton Stitcher has playful ORANGES! Sue and Elizabeth of PGFiber2Art have a great selection of ORANGES! Check them out! Roxanne Lasky of Ideas in Cloth has an eclectic assortment of ORANGE. Jenclair of Bayou Quilts and Dolls! Congrats! 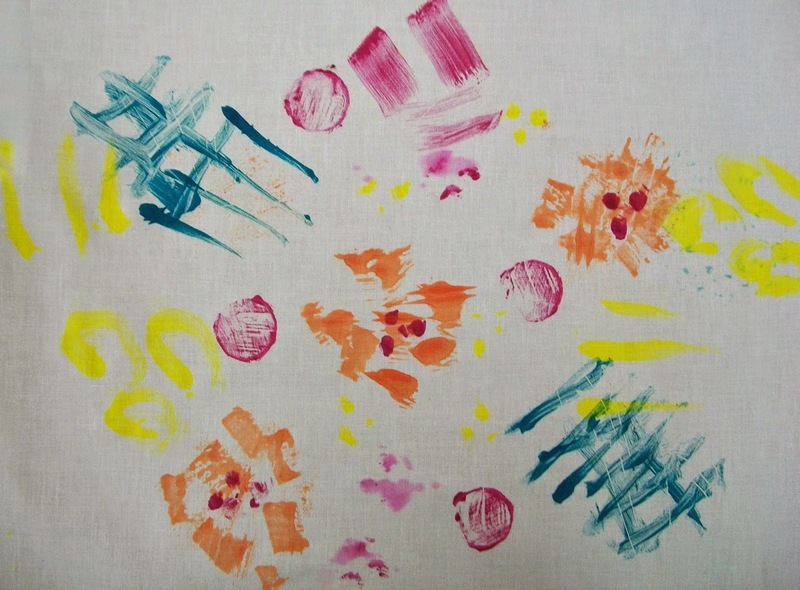 I hope you enjoy reading about and using the kitchen printing techniques in Fabric Printing at Home. There's still so much to explore and many more techniques to be found in the book. Please send me your mailing address (threadborn@cox.net) so the publisher can get your copy off to you. I've been keeping track of your comments and decided to put the names of those of you who stopped by most frequently (and haven't yet won anything) into the hat for a secondary prize. So congrats go to Norma Conway! 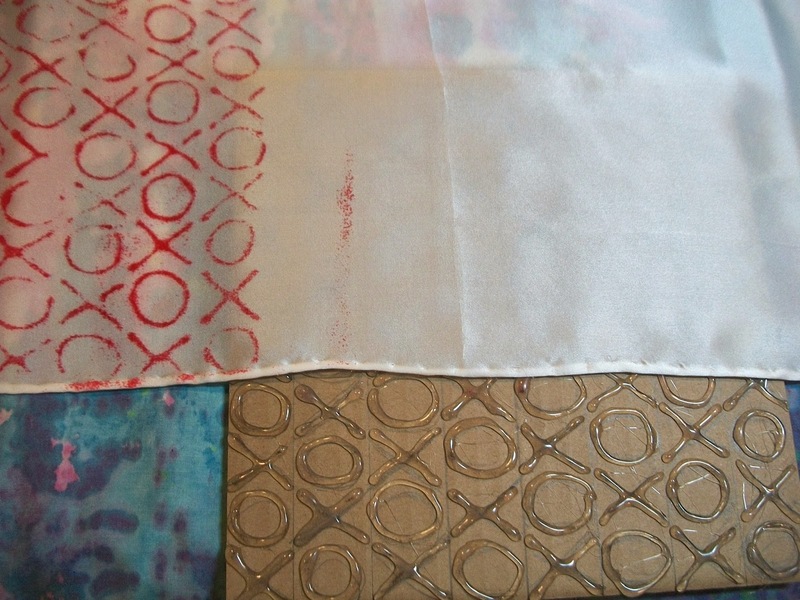 I'll be sending along 3 silk scarf blanks so you can make some of your own beautiful "kitchen inspired" scarves! Please send me your mailing address (threadborn@cox.net) so I can send you your prize. Thank you all for stopping by and leaving your comments. I enjoyed learning from you and hope you enjoyed learning from me and the 13 other fabulous fiber artists on the Tour. 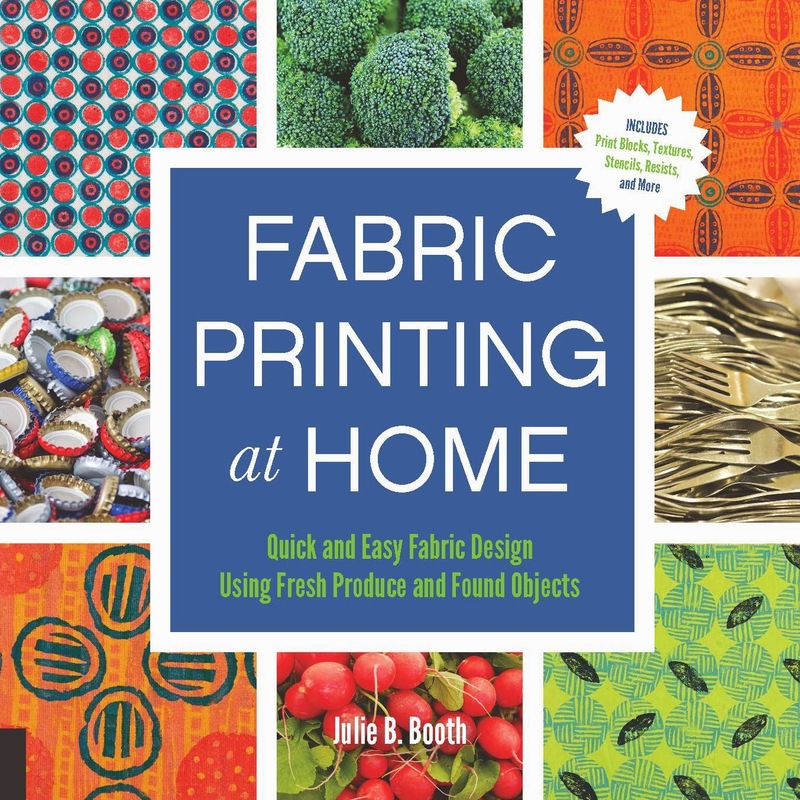 Now that you've had a little taste of what's in Fabric Printing at Home...I hope you will go and purchase a copy. Just click on the highlighted title anywhere in this blog post and it will take you to the Quarry Books page displaying my book information. You can decide to purchase the book directly from the publisher or click on the icons on the page to head over to your favorite online bookseller. OR if you have a local shop you'd like to support, please purchase a copy there. In any case, once you've read the book, I'd love it if you would write a review of it on Amazon...Thanks! 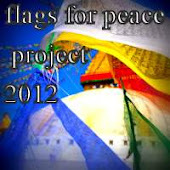 I hope you will continue to stop by my blog to see what I'm up to. You can probably tell that I love to teach! If you live in the Washington D.C. area, consider taking a class with me. I always have a list of my upcoming classes posted in the left-hand column of this blog. If you don't live nearby...maybe I can come to you. Do you belong to a fiber or quilt guild? Maybe we can set up a class or two! To keep in touch with me in the virtual world please "like" my Facebook page, Julie B Booth Surface Design. You can also become a "follower" of my blog by clicking on the "Join this Site" box in the right-hand column. Don't forget to subscribe to my free monthly online newsletter, Julie B Booth Surface Design News! Just put your email address in the box and "click" on the Subscribe button in the right-hand column. My newsletter arrives as a monthly email. In it you'll get a new surface design technique or project similar to what you experienced during this blog tour. Check out the archives of past newsletters to see what it's all about! Thanks again for stopping by and taking part! I so enjoyed all the positive creative energy generated...I just want to bottle it! Cheers! It's Day #13 of the Fabric Printing at Home Blog Tour...it could be your lucky day (just had to say that since it's also Friday the 13th!)! Today the Tour heads over to visit Terri Stegmiller's blog. 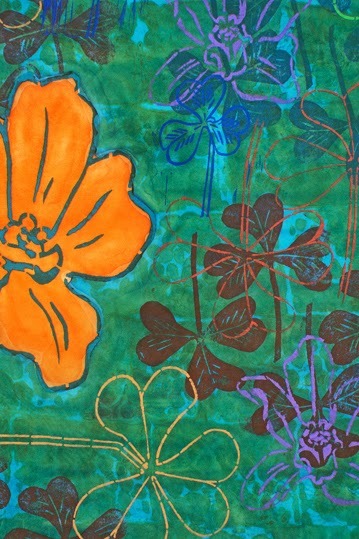 Terri loves to create artwork featuring birds, flowers, cats and girls. She also has a line of stencil and thermofax designs. 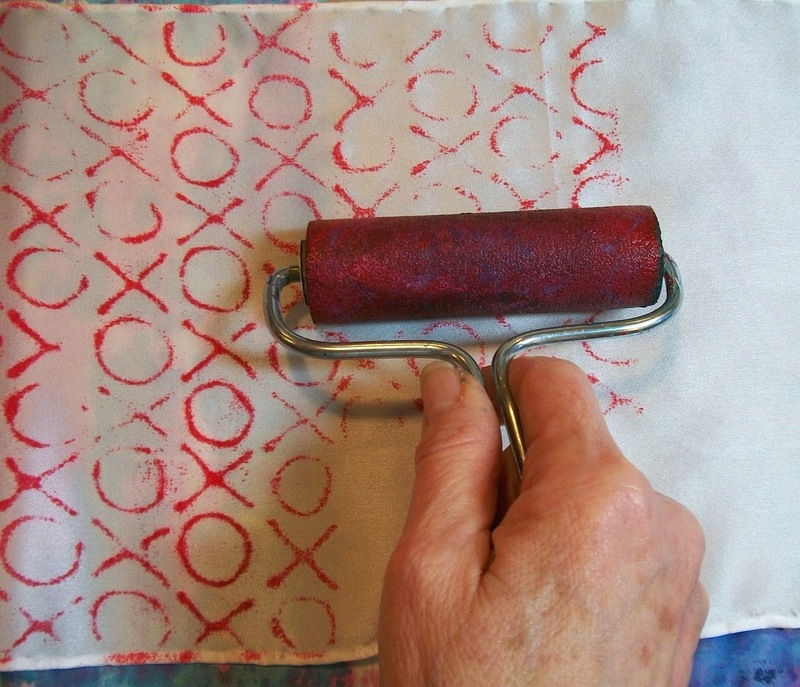 Be sure to stop by Terri's blog today and leave a comment for a chance to win a copy of Fabric Printing at Home. 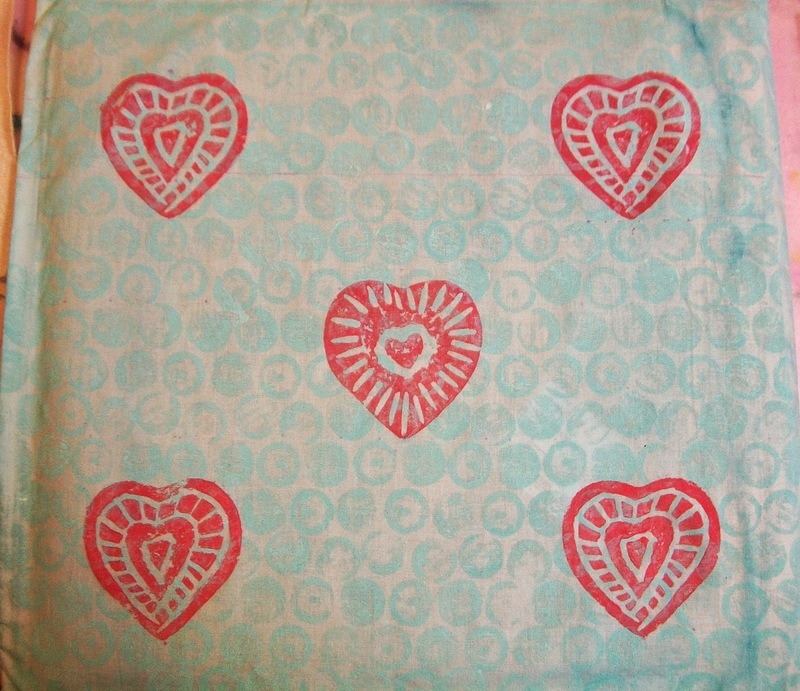 Terri also has three gorgeous hand-printed fabrics that she'll be giving away to a second lucky winner! 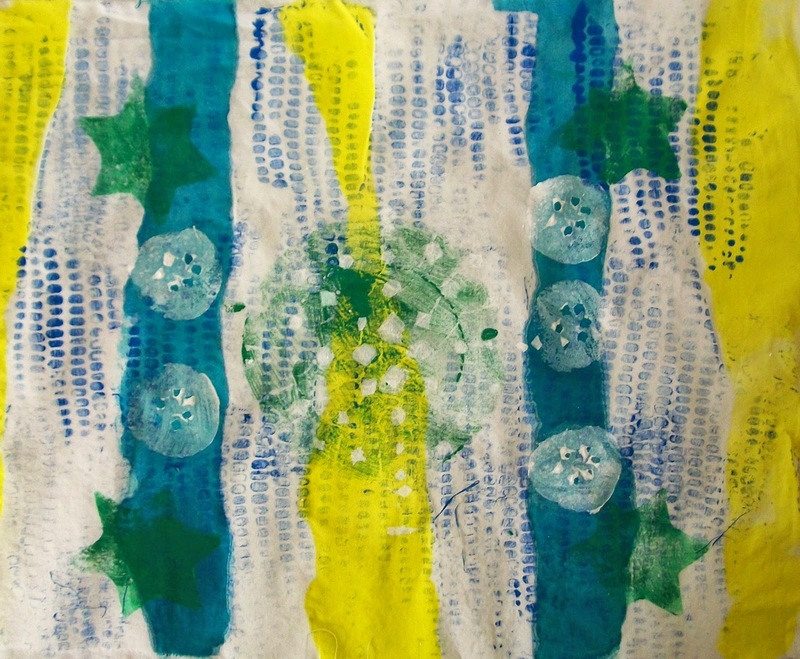 I've been contemplating what we "read" as texture when looking at a multi-layered (painted/printed) piece of fabric. I define texture as an overall background effect that sets off the other more dominant elements in the design. Texture can be "obvious" for example, when printing with a block covered with lentils (see Lynda Heines blog post or Texture Squared pp.34-43 in Fabric Printing at Home) or rolling an ear of corn across the fabric (see Lynn Krawczyk's blog post or Creating Background Textures with Vegetables pp.50-53 in Fabric Printing at Home). A combination of repetition of shapes and the small scale of the individual elements contribute to us viewing these prints as texture. But can other types of blocks "read" as texture and if so, what causes us to see them as texture? Here are some thoughts (and some fabric samples!). Scale: The typical texture block often has small-scale elements that when printed give an overall textural effect. Larger designs can imitate this small-scale feel if the design is broken up or comprised of a number of smaller elements. Fabric printed with incised foam block. 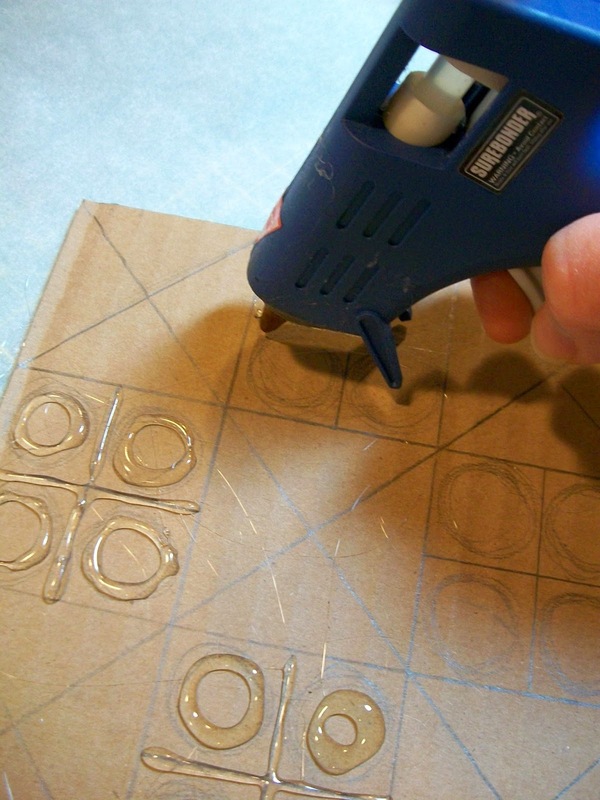 The concentric circle designs in the large round foam block give an overall effect that "reads" as texture. Color blending: If the printed design is the same color as the background fabric or slightly lighter, darker, warmer or cooler than the background color, it will blend and "read" as texture. Fabric printed with incised foam blocks. 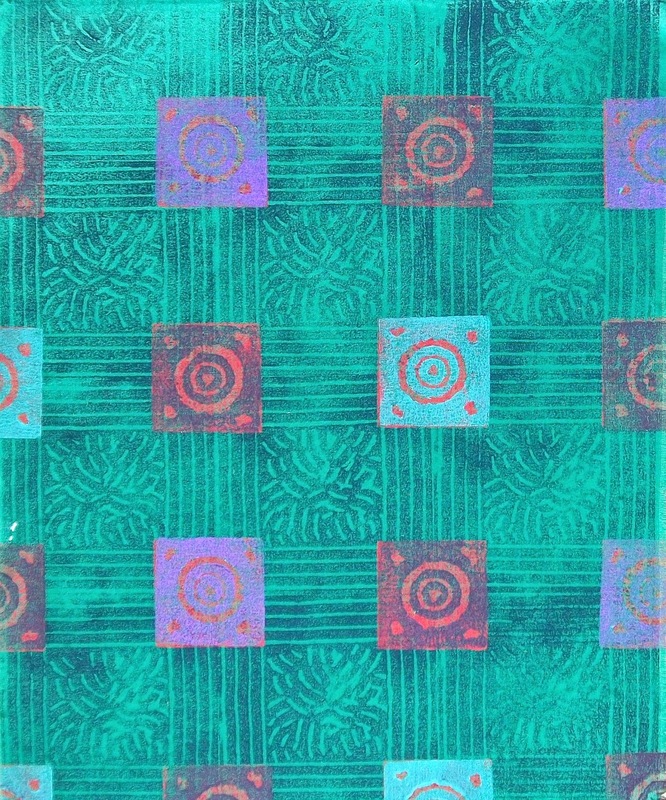 The larger block is a slightly darker green than the color of the background fabric and "reads" as a texture. 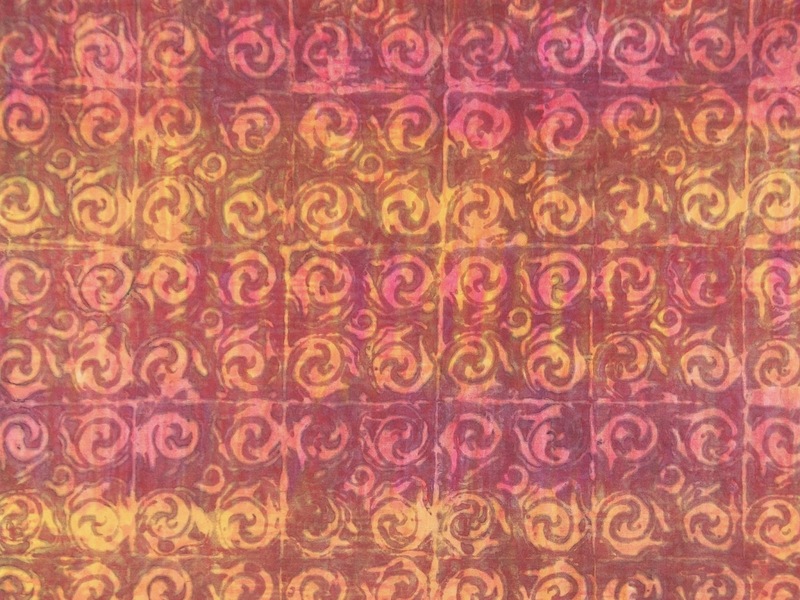 Color contrast: If the focal/dominant elements of the fabric design strongly contrast with the background print, the background print will read as a texture. Fabric printed with incised foam blocks. The black focal prints contrast sharply with the pale blue prints of the larger block. 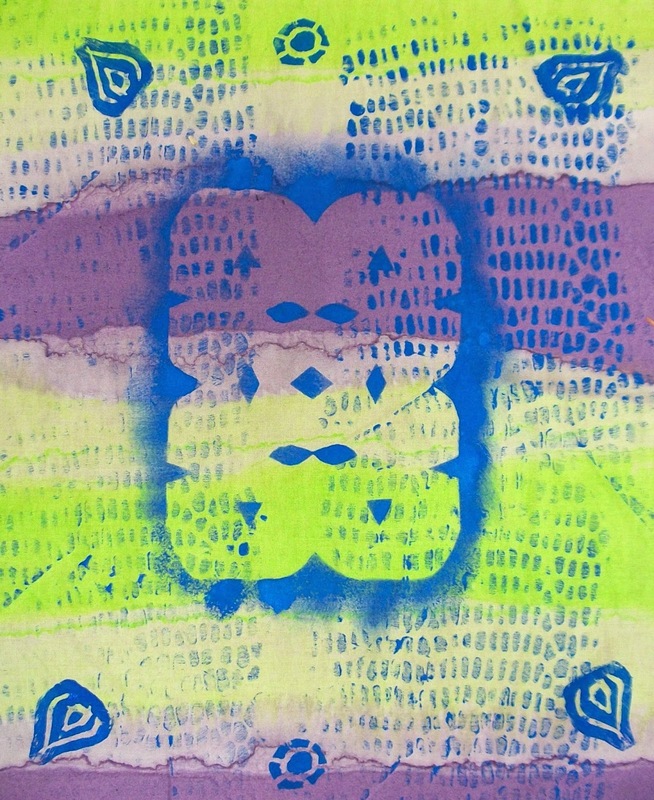 The block printed in the pale blue "reads" as a texture in this piece. 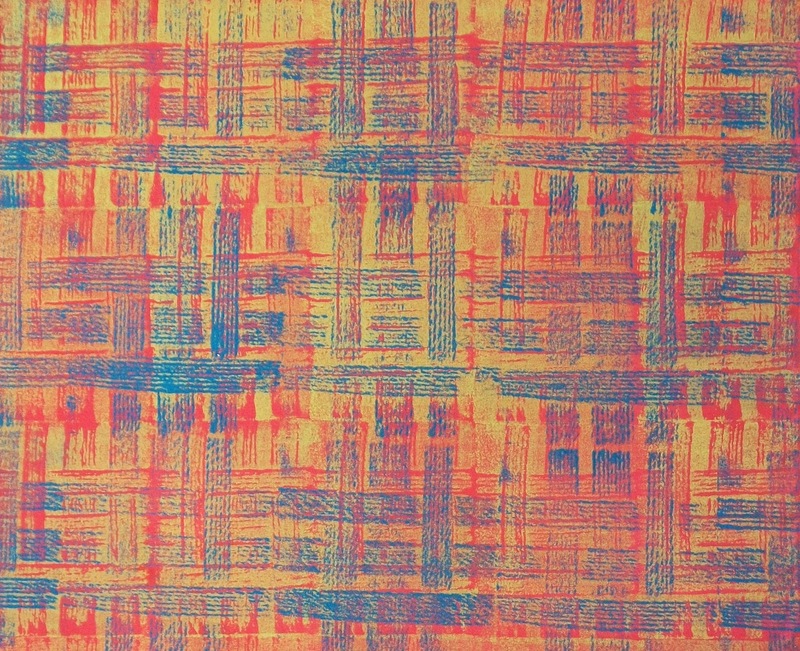 Repetition: If a print is repeated across a piece of fabric, it can often "read" as texture. 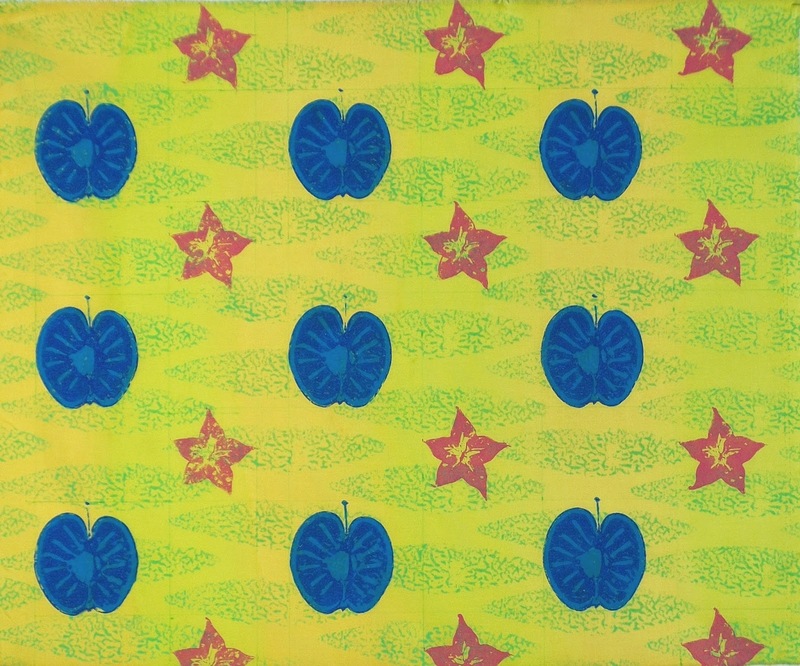 Fabric printed with fruit. The repeating prints with cantaloupe rind "read" as texture. 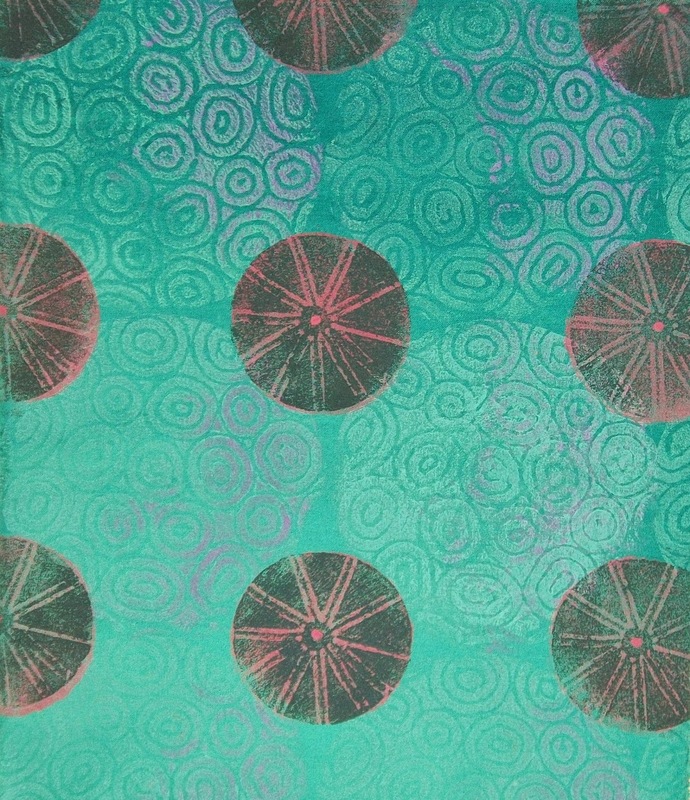 Overlapping prints: Print designs or parts of designs that overlap can appear as texture (see Cheryl Sleboda's blog post about printing with a carrot). 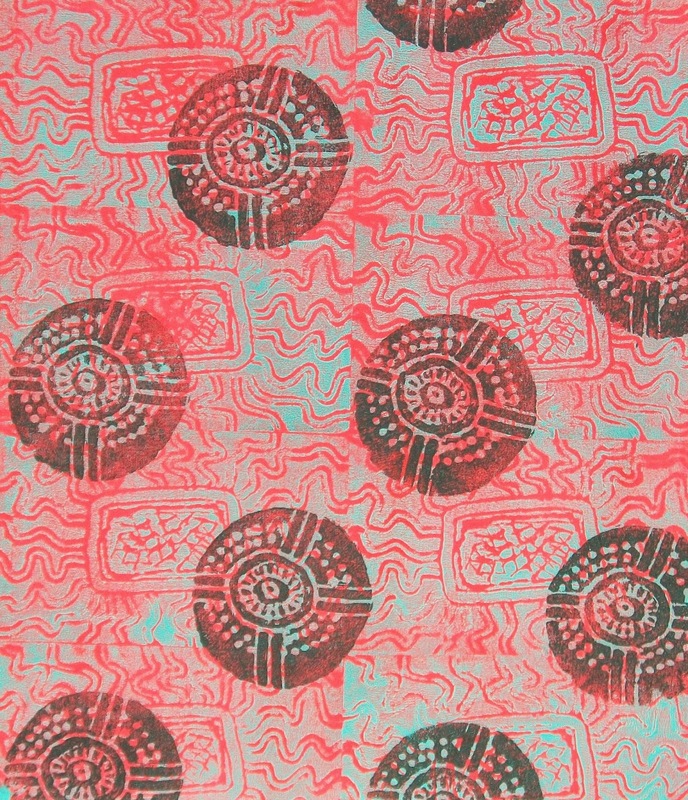 Fabric printed with a string block. 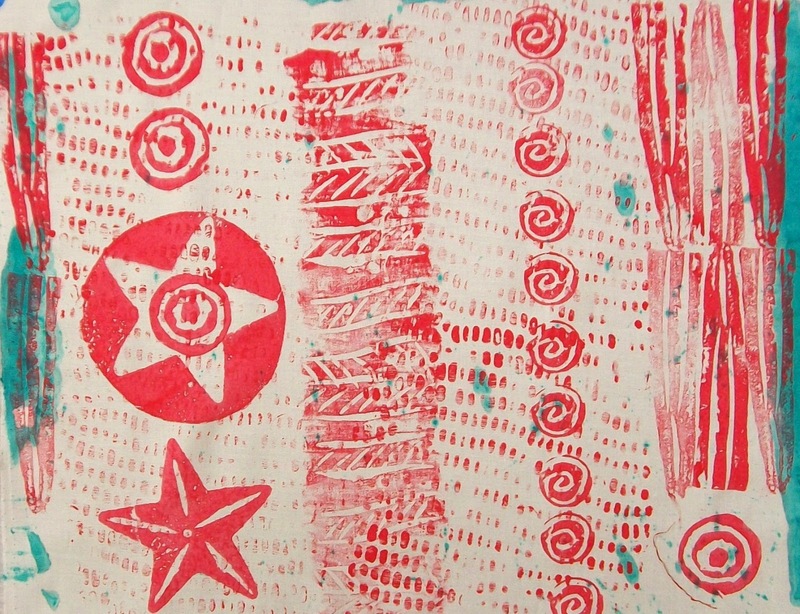 Overlapping prints using a block wrapped with string "read" as texture. 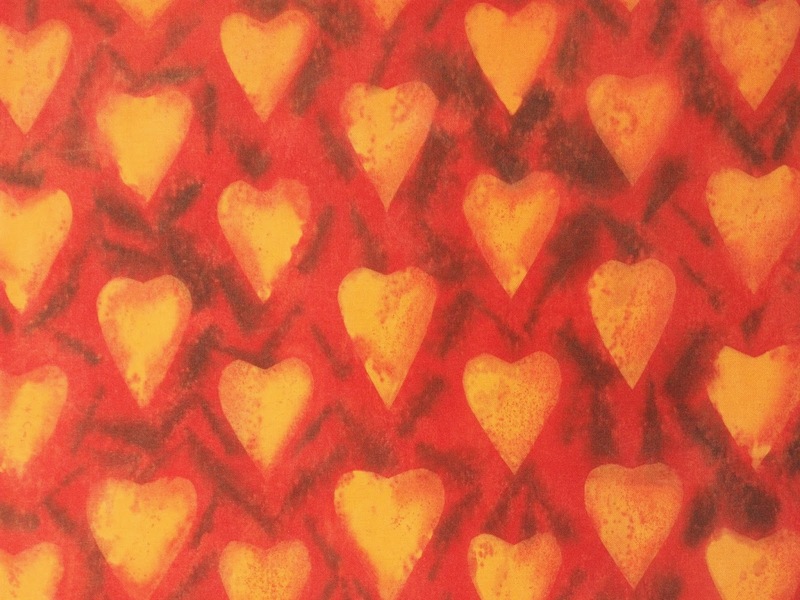 Of course, most of the time, the qualities that make a print appear as a background texture don't appear singly. For example, color contrast and color blending can appear in the same piece of fabric. How do you use texture in your work? 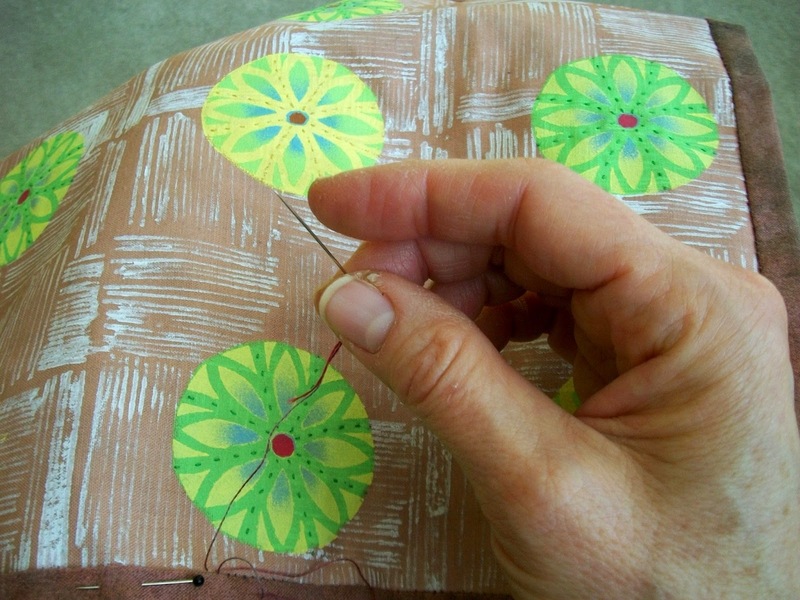 Do you have a favorite method/technique for bringing texture into your work (printing, stitching, beading...?)? 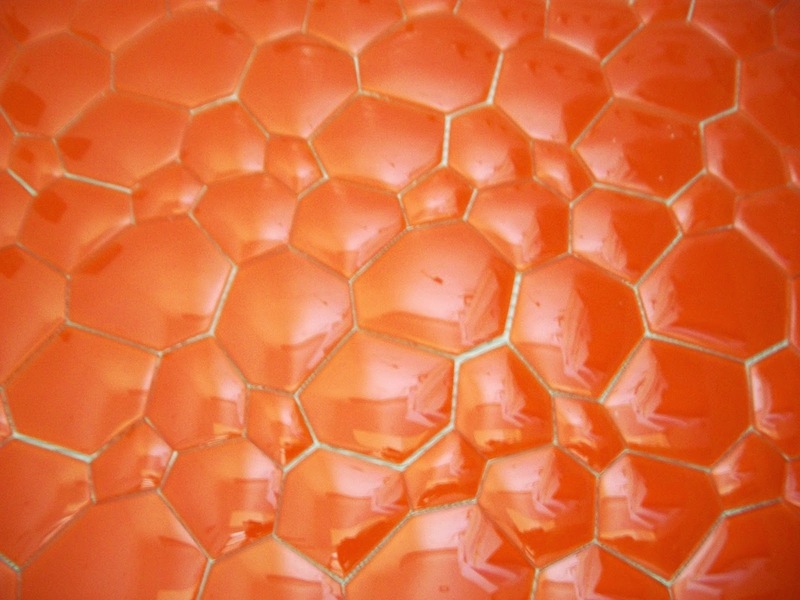 How does the addition of texture enhance your work? 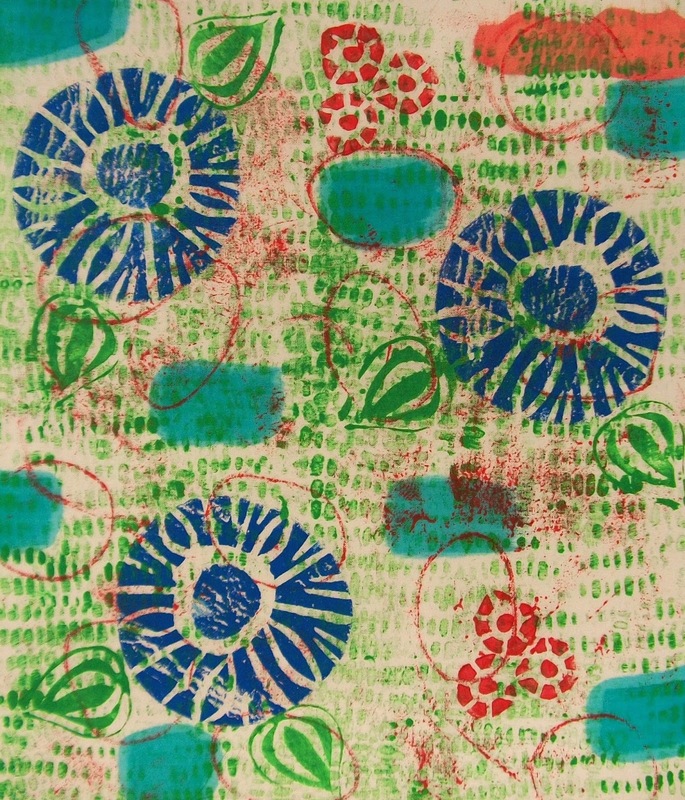 Learn about printing with fruit in Chapter 3: Beyond the Potato Print p. 57. 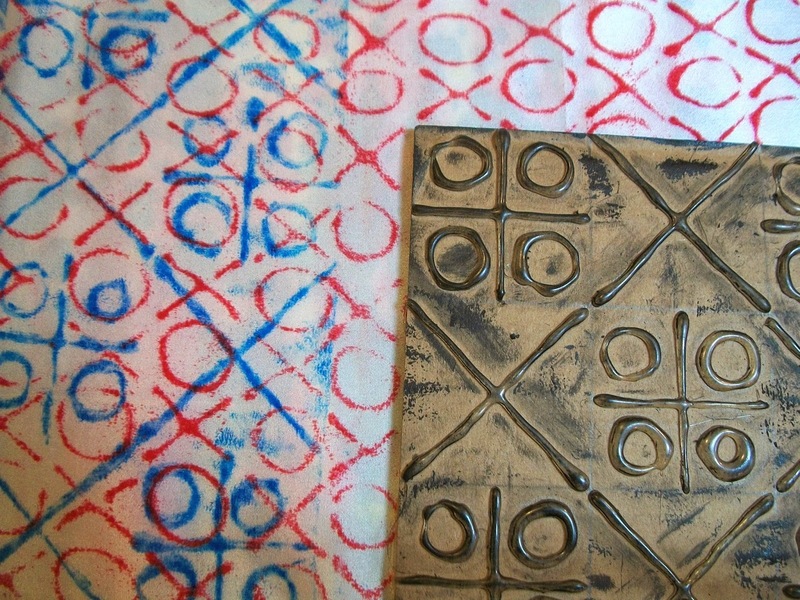 Learn about printing with string blocks in Chapter 2: Kitchen Textures and Found Object Printing pp. 36-37. 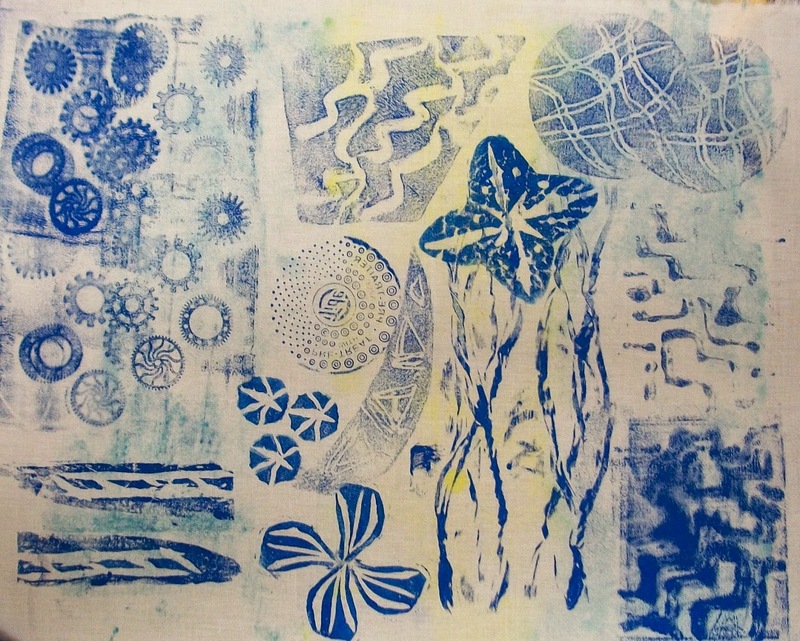 All in Fabric Printing at Home! Today's giveaway is one yard of Kona Prepared for Dyeing Fabric. Leave a comment for a chance to win. I will choose a winner at 11:00 PM Eastern USA time. Check tomorrow's post to see if you are the winner. 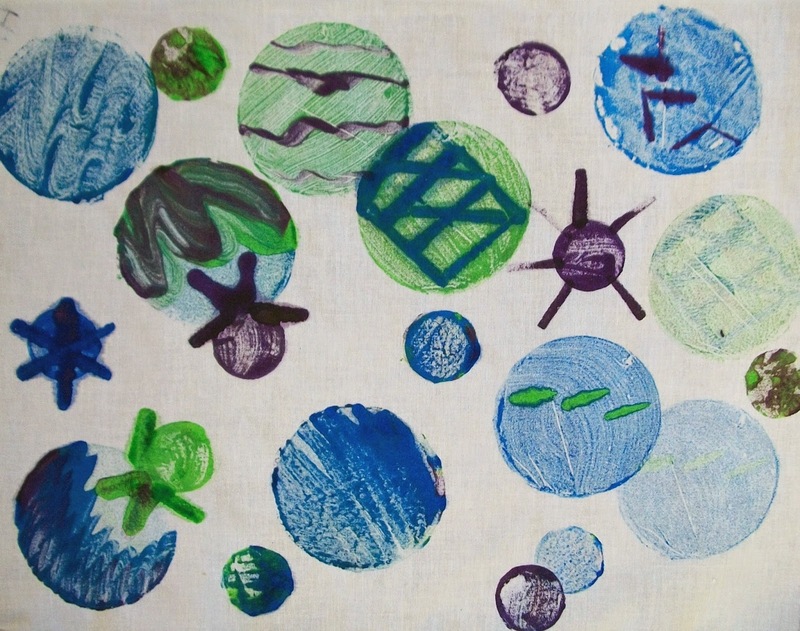 Your comment also enters you in the final drawing at noon on February 15 for a free copy of Fabric Printing at Home: Quick and Easy Fabric Design Using Fresh Produce and Found Objects. And now for the winner of yesterday's giveaway (one yd of Kona PFD)...congratulations to Marcia Coling! Please email me with your contact information (threadborn@cox.net) so I can send off your prize. Tomorrow is the last day of the tour. Our final stop is Jackie Lams blog. Jackie is an amazing mixed media and graphic artist. She finds much inspiration from her growing family (yay Baby Q.!) Find out more about her in tomorrow's post. 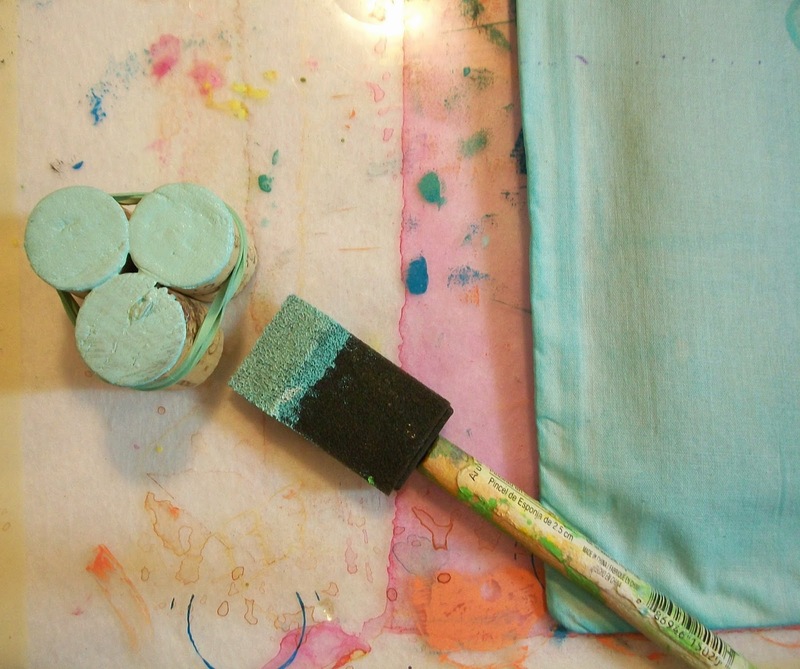 It's Day #12 of the Fabric Printing at Home Blog Tour! Cheryl Sleboda is a comic book industry executive by day and an award winning art quilter by night. 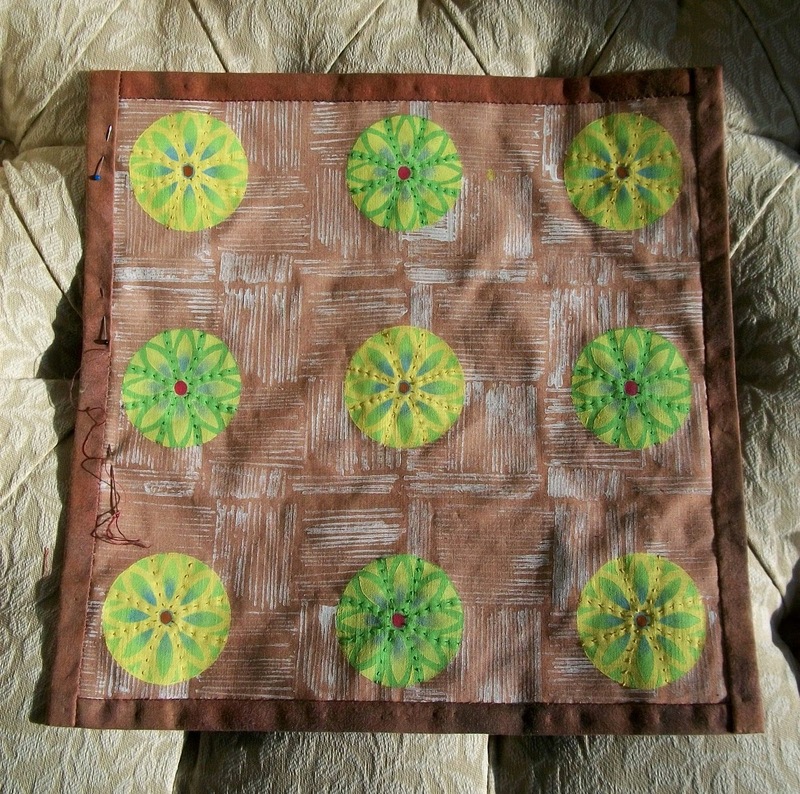 Cheryl is a teacher, lecturer, author, and designer and the owner of her own quilt business – www.muppin.com. She currently has a yearlong art quilt technique series called “Technique of the Week” on her YouTube channel. 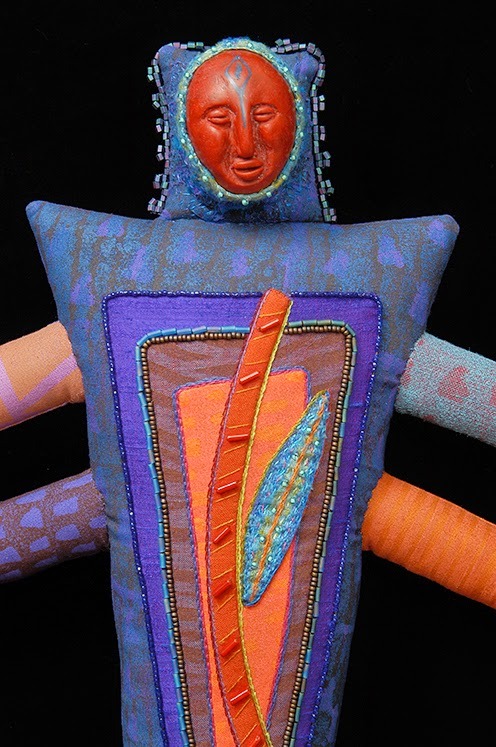 Cheryl is also an expert on electronics in quilts and has been recently working with dimensional fabric manipulations. 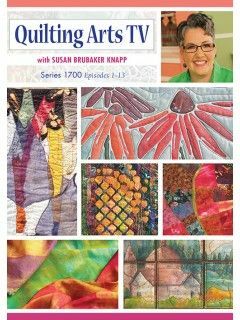 Cheryl has been featured in Quilting Arts and Generation Q magazines, been featured many times on Quilting Arts TV, and is the author of the “Heirloom Sewing Techniques for Today’s Quilter” DVD by F+W Media. 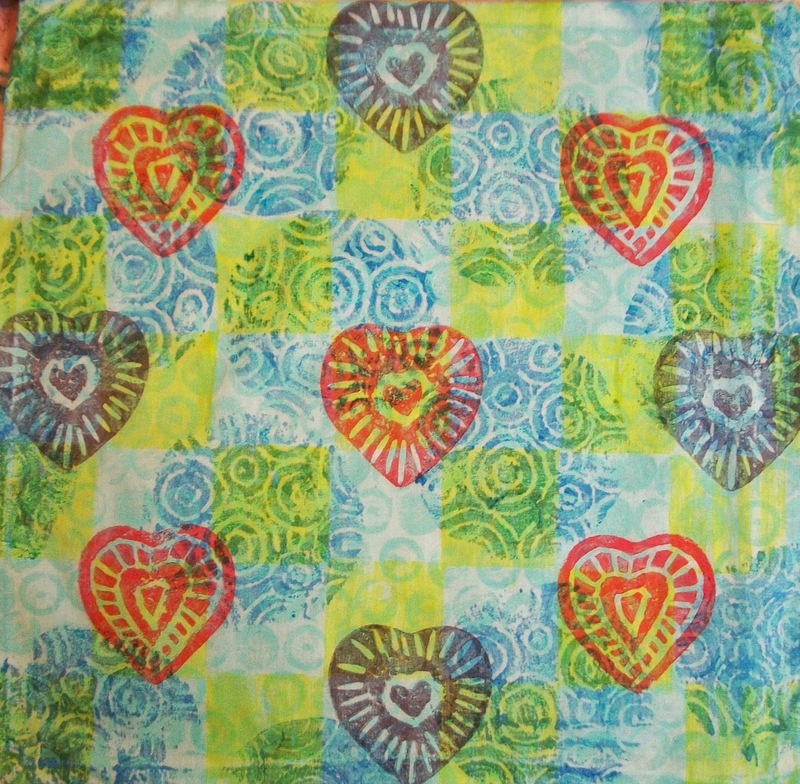 Be sure to stop by Cheryl's blog today and leave a comment for a chance to win a copy of Fabric Printing at Home. Today's post started out as a project and turned into a lesson in awareness, especially when things aren't quite "working". 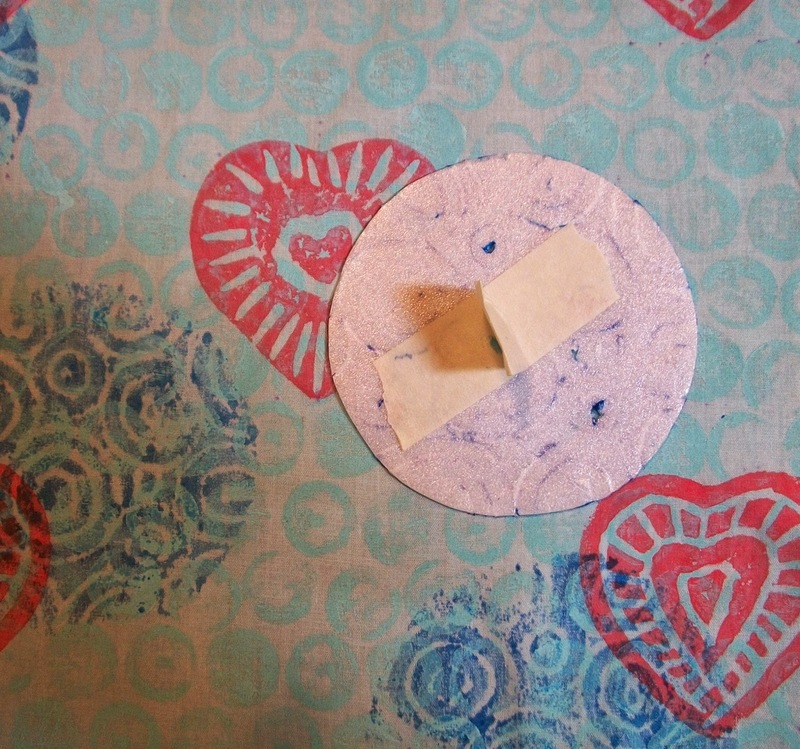 The project was designing a Valentine's-themed pillowcase using carved turnips and found object printing with bottle corks. I printed the background of the pillowcase with the corks (see Found Objects and Kitchen Tools on p. 44 in Fabric Printing at Home). I chose an opaque fabric paint color that would blend with the blue background (which I painted with blue transparent fabric paint) so that it would "read" as a texture. 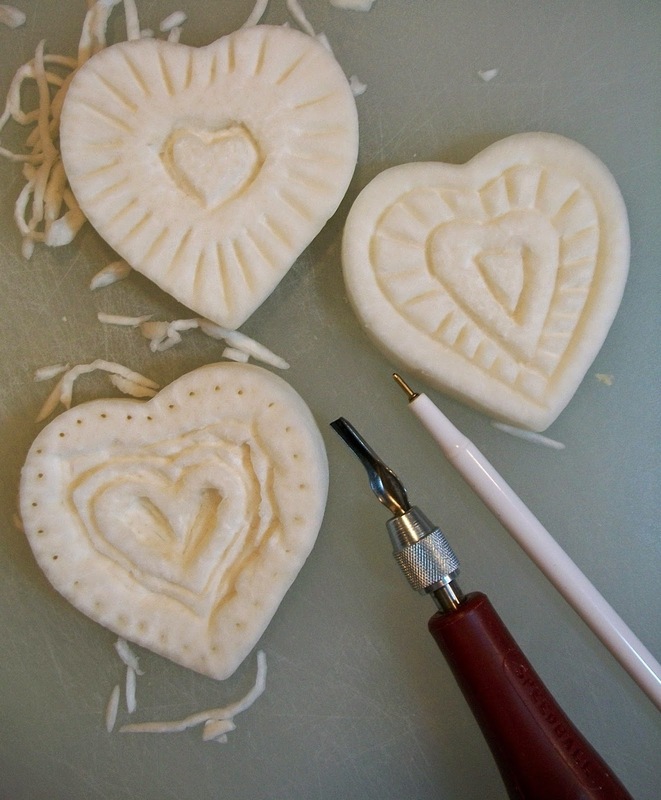 I then cut turnip slices with a heart-shaped cookie cutter and carved designs in the shapes with a linoleum carving tool (see Slicing and Dicing: Printing with Vegetable Shapes on p. 56 in Fabric Printing at Home). I printed these veggie blocks with a warm red opaque fabric paint. Here's what I realized...it was boring!! 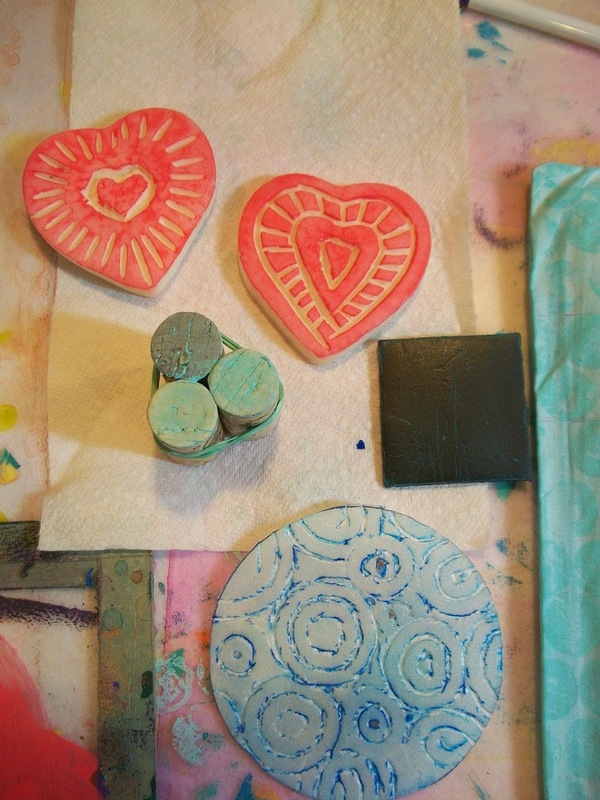 I decided to do some printing with recycled foam blocks (see Making Your Mark: Designing Print Blocks from Recycled Foam on p. 90 in Fabric Printing at Home). 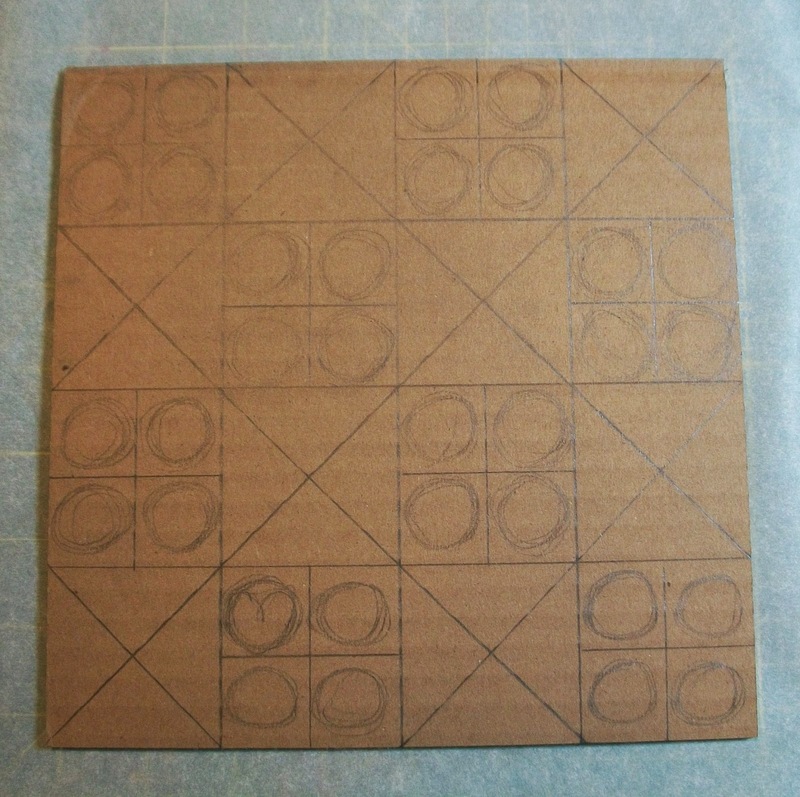 I chose a round block with concentric circles and a plain square block. I also decided to use undiluted and slightly diluted transparent fabric paint on the blocks so that the first layers of printing with opaque paint would show through. First, I randomly printed with the round foam block using blue paint. 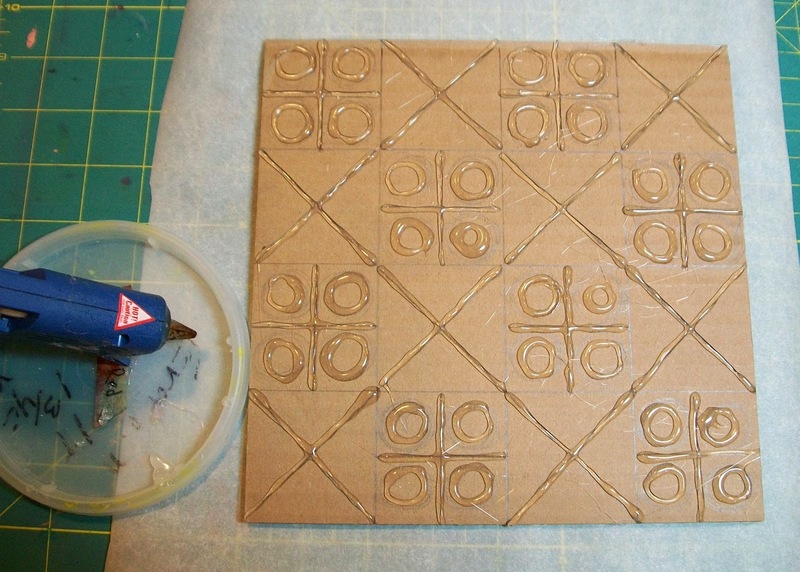 Then I printed a checkerboard pattern with the square foam block using yellow paint. I still wasn't completely satisfied. I decided to go back in with one of the carved turnip heart blocks using a mixture of slightly diluted blue and red transparent paint. Although, I'm still not completely satisfied with the result...it is certainly no longer boring!! What do you do when you're working on a piece and it's not turning out quite the way you planned? Do you forge ahead? Do you set it aside? Leave a comment about your tactics! And now for the winner of yesterday's giveaway (journal and freezer paper)...congratulations to Jewelry Treasures by Louise! Please email me with your contact information (threadborn@cox.net) so I can send off your prize. Tomorrow the tour stops at Terri Stegmiller's blog. 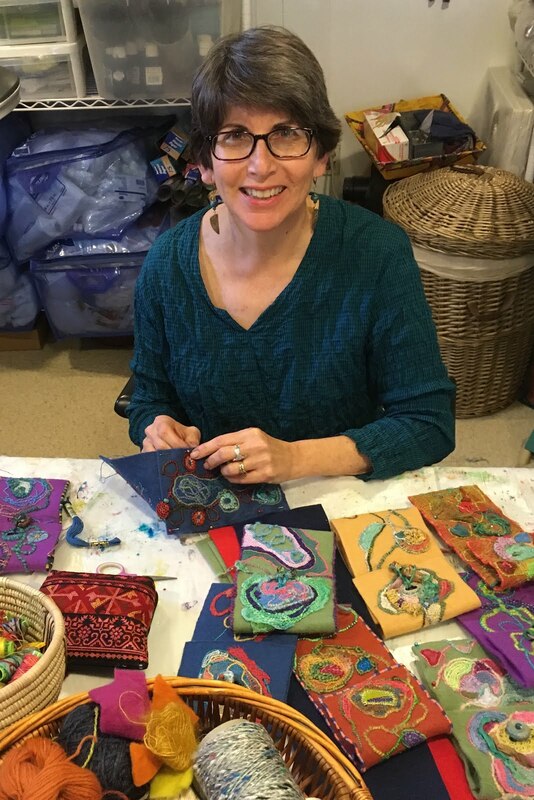 Terri creates quilts full of whimsy! Find out more about her in tomorrow's post.